Once again I am struck by the stark contrast of modern travel and polar expeditions. Just three days ago I was at the South Pole and now I am sitting comfortably in Punta Arenas, Chile after a successful Last Degree South Pole Fat Bike expedition working as a guide for Antarctic Logistics and Expeditions (ALE). Unfortunately, I can't even tell what day exactly we arrived at the pole but it was a good team effort that ultimately allowed for our success. Yoshi and I were able to make somewhat decent time aided by a snowmobile track laid down by Rob Smith the ALE South Pole camp manager as well as the overall logistical support from ALE. In the end, it took us six and a half days to complete our 68-mile 'Last Degree' journey. 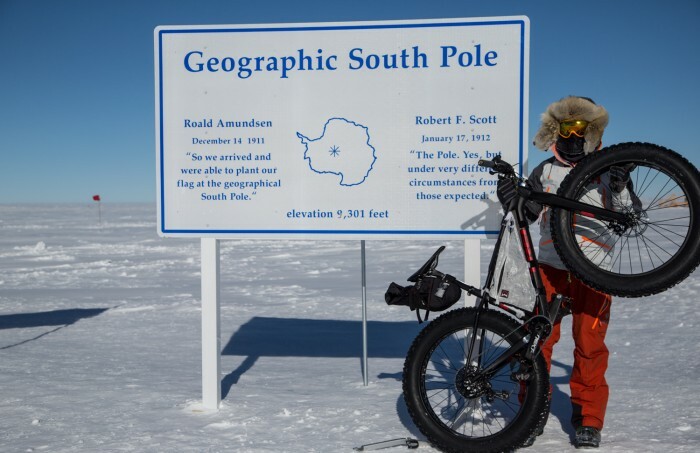 While there have been a smattering of other bicycle expeditions to the South Pole, this is the first time anyone has guided a Last Degree expedition like this. Yoshi, the ALE client I was guiding, was the perfect companion for the trip and over the past two and a half weeks we have become good friends. To reach the pole by bicycle meant that we actually didn't bicycle the entire distance. We alternated between walking and riding. Walking then riding. Riding then walking. Surprisingly, biking wasn't much faster than walking... but it was easier -- at least at times. Riding at that latitude means, you are traveling at an elevation of roughly 9,000 feet which feels much higher due to the fact that the atmosphere is thinner at the poles. Additionally, Antarctica is a desert, and on the polar plateau, it is even drier than the ALE base at Union Glacier. Therefore, the drag on our sleds was substantial (even though they were very light). It often felt like we were dragging the sleds across sand - especially when the snow was blowing. While much of Antartica appears flat, the surface is a rolling sheet of ice with inclines and descents that can go on for several miles. Coupled with a constant head wind, climbs up steady inclines for hours could be soul draining and spirit sucking. We maintained a steady pace and regular schedule which is often the key to successful polar expeditions - stopping to take a drink and eat something every hour. At the end of eight hours, we would set up camp and start melting snow and eating - refueling for the next day. Tent life in Antarctica is quite comfortable as it is 24-hour day light and the desert like conditions make it very easy to dry frosty gear. We almost got stuck at the South Pole when one of the engines on ALE's Basler froze but with some quick thinking from the captain and a little extra heat from one of the South Pole mechanics, the ice was thawed. The nearly 700-mile flight back to Union Glacier took roughly three hours as a stiff tail wind pushed us North. Disembarking from the plane, it was 30 degrees warmer than the pole! We didn't have much time to linger unfortunately as a potentially bad weather window later in the week meant that ALE would fly the Ilyushin-IL76 a few days earlier to ensure we would make it off the 'ice' in a timely manner. Obviously, there is more, but the little details will take a some time to get out. The impact and meaning from these types of adventures often take weeks to process. For this moment however, I am caught up in the simple process of disassembling my bike and packing up to go home. I am comfortable with in these in between times as coming and going from expeditions is something that I have been doing for the past 20 years. Leaving Antarctica is not a good bye. This is my fifth expedition in Antarctica and I will definitely be back! Image: At the Geographic South Pole! Day 24. At South Pole?